MPC's Foil AlumaMark blank labels and tags allow you to create custom creations with vivid backgrounds using your CO2 laser. Available in a rainbow of beautiful hues and finishes, AlumaMark is ideally suited for name badges, trophy plates, equipment labels, property tags, and many decorative interior applications. MPC’s foil AlumaMark blank labels are strong, lightweight, and flexible enough to adhere to contoured or uneven surfaces. The foil label will fracture if removed from its mating surface, offering an effective security feature for asset tracking. 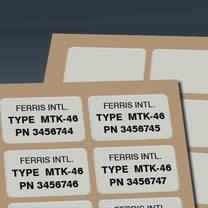 Why Choose MPC's Foil AlumaMark Blank Labels & Tags?